This is very useful information for this time of year and I am reposting this from the “Our Best Bites” blog. During December, we're going to be doing some extra posts to help you guys make it through the holiday season with your sanity in tact! This is a really quick tip that will help you in all your candy-making endeavors (like Apple Cider Caramels and Peanut Brittle). When you're making candy, being able to accurately measure the temperature is absolutely essential, but how do you know if your candy thermometer is accurate or not? First, you need a pot, any size, of water. Clip the thermometer onto the side of the pan, making sure the knob on the bottom of the thermometer (anyone have a more accurate term for me? It's 1:43 in the afternoon and I'm still in my pajamas if that gives you any idea of where my brain is right now...) isn't touching the bottom of the pan. Now, bring the pan of water to a rolling boil over high heat. Let it boil for 10 minutes (make sure you're using a big enough pan that you have enough water to last 10 minutes). The boiling point of water is different depending on where you live (thanks readers!) so check this calculator to find out. So, say your thermometer says 202 degrees, and you know that the boiling point is 212. You'll know that you need to add 10 degrees to whatever your thermometer says. On the flip side, if the thermometer reads at 222 degrees, you need to subtract 10 degrees from whatever the thermometer is reading. To make sure you remember, you can either write "+ ____" or "-____" (whatever the difference is) directly onto the thermometer with a Sharpie or onto a piece of tape that you can wrap around the thermometer or its protective sheath. 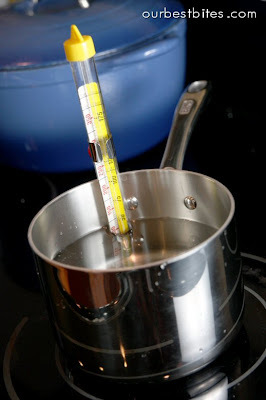 --If the temperature reads above 212 F (or whatever your boiling point is), you need to subtract 212 from the number your thermometer is displaying and then, when you're making candy, subtract that number from the reading you get on the thermometer. --If the temperature reads below 212 F (or whatever your boiling point is), you need to subtract that number from 212. 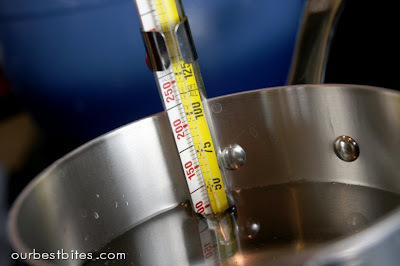 When you're making candy, add that number to the number you get from the thermometer reading. --Be sure to record how much you need to add or subtract in a place that's easy to remember. --Re-calibrate your thermometer at least once a year, or just buy a new one!